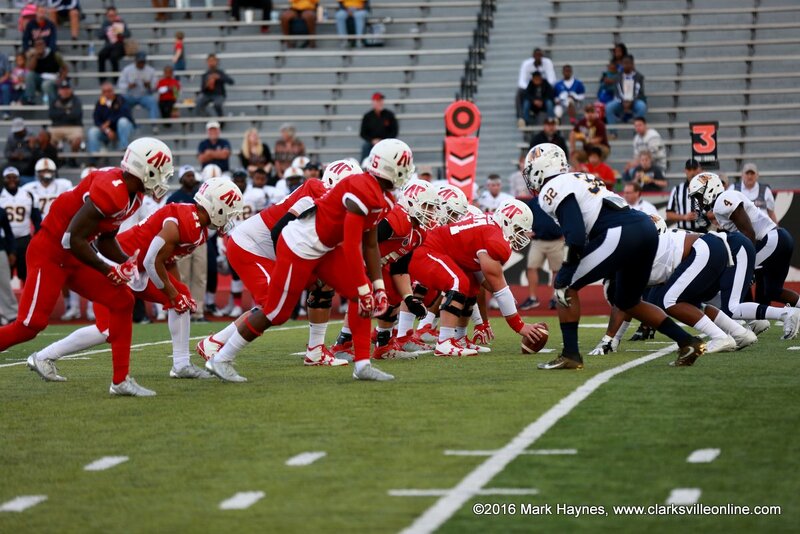 Tennessee State University | Clarksville Sports Network - Clarksville Tennessee's most trusted source for sports, including Austin Peay State University. Clarksville, TN – As Austin Peay State University heads into the final few weeks of its fall semester schedule the football and volleyball teams look to end things with championships and possible NCAA postseason berths. 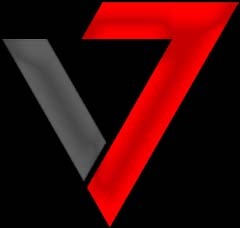 The Governors football team currently owns a 6-4 overall record and a 5-1 mark in Ohio Valley Conference play, which places them second in the conference standings, and the only team remaining that could pass OVC leading Jacksonville State for the conference championship, if the Gamecocks were to lose their final two games and APSU wins its two remaining contests. Austin Peay Football and Volleyball look towards OVC Championships. 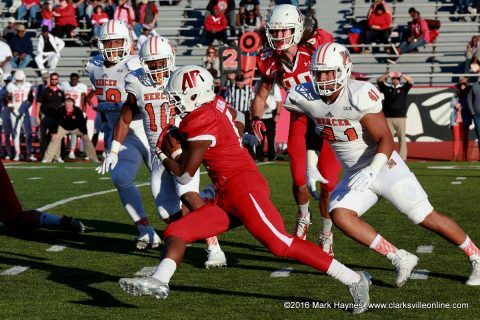 Clarksville, TN – Another week, another big win for the Austin Peay State University Governors football team, the same team that after ending the longest losing streak in the nation earlier this season has continued to build as one of the nation’s best turnarounds in the NCAA in 2017. This past Saturday, October 21st, the Govs (5-3, 4-1 OVC) defeated Southeast Missouri, 38-31, at Fortera Stadium to not only pick up a homecoming victory for its fans and alumni, but its fifth victory of the season – marking just the fourth time by an APSU football team has reached at least five victories in a campaign since 1991. 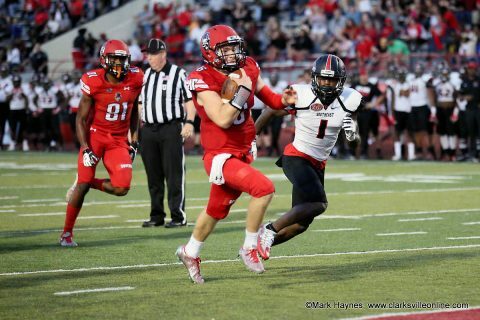 Austin Peay freshman quarterback Jeremiah Oatsvall rushes for a touchdown against Southeast Missouri Saturday at Fortera Stadium. 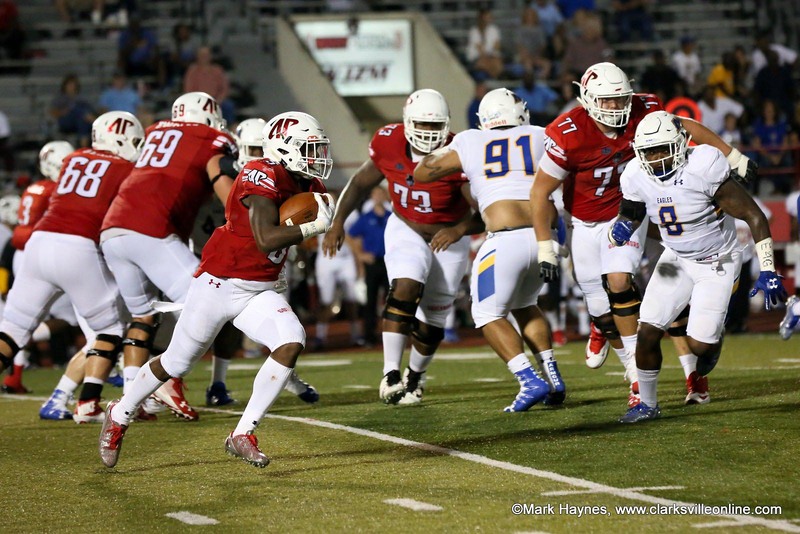 Clarksville, TN – Homecoming is always a big week for any college and Austin Peay State University is no different, but this week is especially big for not only the football team but for several other Governors teams. Leading things off for the week will be the men’s golf team, who will be hosting their own F&M Bank APSU Intercollegiate at the Graystone Golf Club in Dickson, TN on Monday (36 holes) and Tuesday (18 holes) October 15th and 16th. Clarksville, TN – Austin Peay State University’s football team put one big hurdle behind them September 16th, 2017 with its victory over Morehead State, at Fortera Stadium, to end the nation’s longest overall losing streak at 29 games, but now they must refocus and get ready for Ohio Valley Conference play and a couple of another streaks they want to put to bed as soon as possible. The others are a current 21-game losing streak in OVC contests, dating back to October 18th, 2014, when the Govs handed Murray State a 20-13 loss in Clarksville, while they also have a 45-game losing streak in road games – dating back to September 18th, 2010 — when the Governors handed Tennessee State a 26-23 setback at the then LP Field. APSU Football defeated Morehead State 69-13 Saturday night at Fortera Stadium. 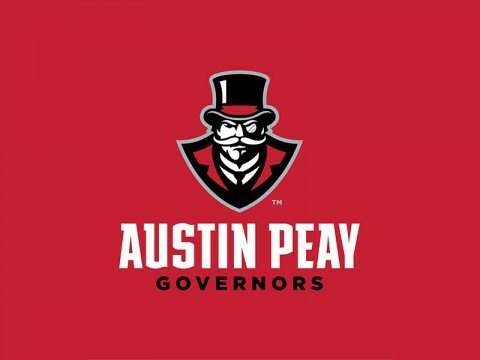 Clarksville, TN – Austin Peay State University head football coach Will Healy will be making his second appearance at the Ohio Valley Conference Media Day, in Nashville, TN, July 24th looking to tell the conference’s media members why this year’s Govs are ready to make some noise in conference play. So far there hasn’t been much in the way of respect for the Governors, who finished the 2016 season winless at 0-11 and 0-8 in OVC play, with several preseason polls all having Austin Peay as a distant last-place ninth in the projected standing, including Street & Smith, Lindy’s Sports and the OVC Media picks that came last week. 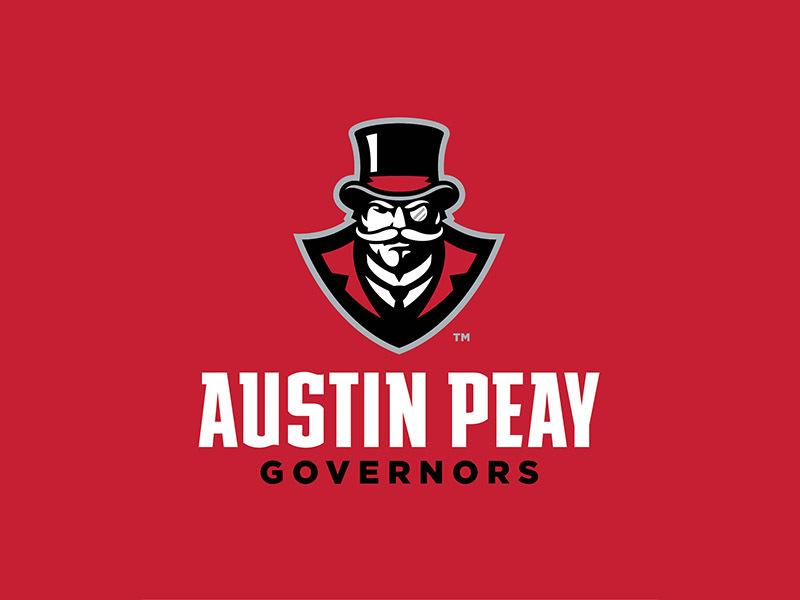 Austin Peay Football hosts Tennessee State this Saturday at Fortera Stadium. Nashville, TN – Future football stars will want to mark their calendars to attend the V7 Elite Future Stars Showcase Series event, April 30th at Tennessee State University. 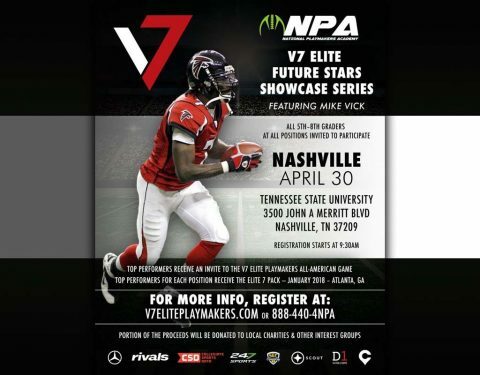 The camp will feature former NFL quarterback Michael Vick. The camp is part of the National Playmakers Academy and is open to all 5th-8th graders in the area. Football players at all positions are welcome. 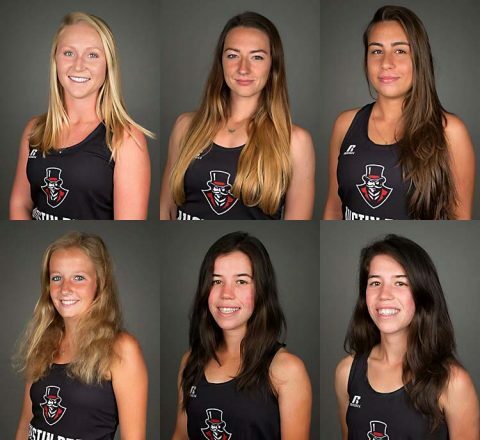 Clarksville, TN – Austin Peay State University’s women’s tennis team made a return to the Ohio Valley Conference postseason in 2016, after a two-year hiatus, but with the start of Ohio Valley Conference play in 2017 the Govs have come out of the gates quickly, but face some tough opponents this week as they try to remain undefeated in conference play. The Govs enter the week with an overall record of 5-5, but more importantly a 3-0 mark in OVC play – one of three teams yet to drop a match in conference play this year – having opened OVC play with victories over Tennessee State (5-2) and Belmont (4-3) on the road and Jacksonville State (6-1) at home this past Saturday. Knoxville, TN – Junior Jaime Nared recorded her third consecutive double-double as No. 22/25 Tennessee defeated Tennessee State, 86-36, on Wednesday at Thompson-Boling Arena. Nared scored 16 points to go along with 10 rebounds, three steals and two assists on the night. 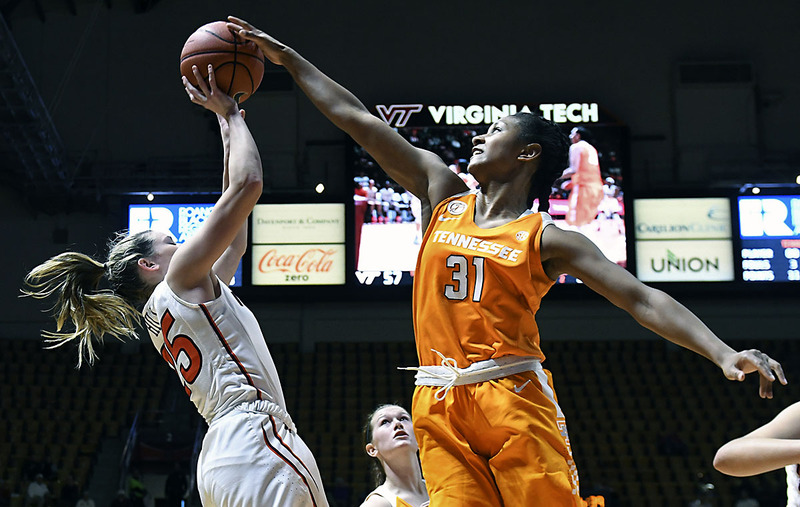 Redshirt junior Diamond DeShields posted her second double-double of the season, totaling 15 points, 10 rebounds, three assists, three blocks and two steals. A strong defensive outing by Tennessee (4-2) helped the Lady Vols roll past the Lady Tigers (1-5) in front of a home crowd of 7,845. TSU was held to 20 percent (13-65) shooting on the night and no Tiger reached double-digits in scoring. UT finished with 14 steals and 10 blocks in the game. Knoxville, TN – No. 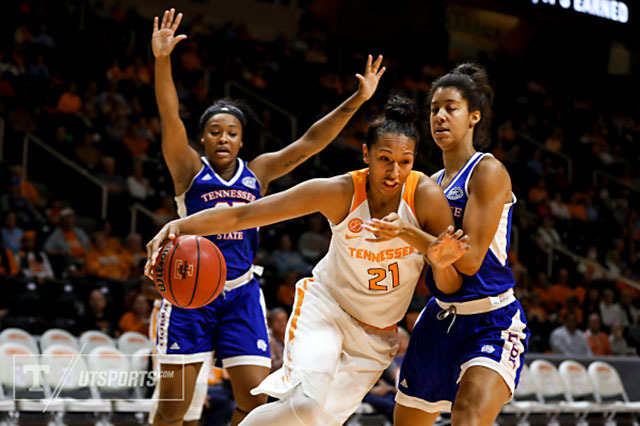 22/16 Tennessee returns to Thompson-Boling Arena on Wednesday night after a three-game road stretch to take on Tennessee State for a 6:00pm CT tip on SECN+ (WatchESPN). Wednesday’s game will not be broadcast on TV, but fans can catch all of the action online through SECN+ on WatchESPN. Visit WatchESPN.com or download the WatchESPN app to view the game on a computer or mobile device. Lyndsay Rowley (play-by-play), Brittany Jackson (analyst) and Maddy Glab (reporter) will call the action. Fans can also tune into their local Lady Vol Network station to catch Mickey Dearstone describing the action as the Lady Vols take on Tennessee State.